MCM027 4" X 5" ICON MATTED TO 8" X 10"
The icon of the Sorrowful Mother is a synthesis of several traditional icon motifs. This scene is taken from the account of the Passion (see Mt 27:57-61, Mk 15:46, Lk 23:50-53, Jn 19:38-40). We can all identify with the grief of the Blessed Virgin as she cradles her son and Our Lord in her arms. The piercing red background reminds us of Christ’s sacrifice, while the cross stands in triumph as the instrument of His defeat over death. The Crucifixion is a popular subject in iconography. The Removal from the Cross is depicted less often. In this scene Jesus� body is lowered by Joseph of Arimathea and Nicodemus in a linen cloth to his Mother Mary, Mary Magdalene, John the beloved apostle and the Roman centurion Longinus. Still less frequent, yet traditional, are icons of the Cross alone; it is the only inanimate object venerated in iconography. This icon is a synthesis of the latter two. Sr. Marie Paul has taken several familiar canonical icons and shifted the emphasis to portray a scene that makes the empty cross prominent. At the same time it also renders a pieta familiar to us in Western art, such as Michelangelo�s in St. Peter�s Basilica in Vatican City. This scene is taken from the account of the Passion of Christ in all four of the Gospels (see Mt 27:57-61, Mk 15:46, Lk 23:50-53, Jn 19:38-40). This icon, while based on a familiar subject, is an original depiction that simplifies the scene and refocuses on the relationship between Mary and her son. The Latin text in the upper left-hand corner reads Mater Dolorosa, �Sorrowful Mother.� Here we see the Blessed Mother positioned between her lifeless son and the cross�the instrument of his painful death and the sign of his victory over sin and death. 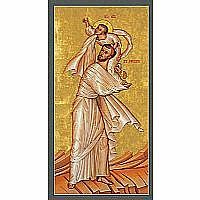 Most backgrounds we see on icons are gold leafed because the metallic quality of the gold reflects light reminding us of the transfigured light of heaven. There are exceptions, however, especially in the Stroganov school of Russia where backgrounds were painted. Many icons of martyrs have a crimson background, because the martyrs have witnessed to the Paschal Mystery of Christ in their own blood. 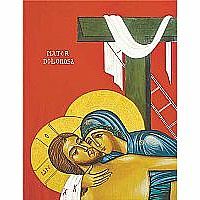 The background of this icon is red to symbolize the sacrifice made by Christ on the cross. We see in this image a simplified T-form cross, which is generally used only when the two thieves that accompany him are also illustrated into the icon. The traditional Orthodox cross has two parallel crossbeams at the top (one stretches the span of Christ�s arms, the other above the head holds the inscription of Pilate: Jesus of Nazareth, King of the Jews) and a diagonal crossbeam for the feet. Imagery we traditionally see above the crucifix includes: Lord Sabaoth (God the Father) and the Holy Spirit descending in the form of a dove above the cross; a spear and reed with a sponge on it; the sun turned black and the moon the color of blood (Joel 2:31; Acts 2:20); various writings attesting to the glory of Christ; and a skull of Adam exposed beneath the cross. Here, all of this has been stripped away to reveal a sober image of the cross. Only a ladder and a white linen cloth are present from other icons of the Removal from the Cross. The cross itself looks flat and has been drawn according to inverse perspective, a technique in iconography by which objects closer to the viewer become smaller. This technique, which differs from customary Renaissance optics, actually draws us into the scene. The main focal point of this icon is Mary, who holds in her arms the body of her son, Jesus. 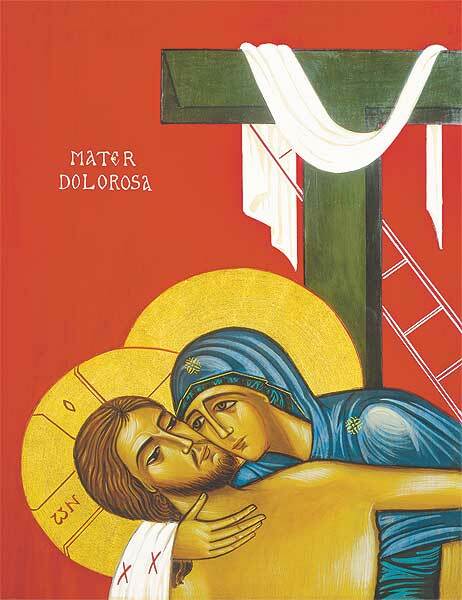 Generally in icons of the Removal from the Cross or the Entombment of Christ, Mary stands in a vertical position to the left of Jesus who lies perpendicular to her. Some show a more sentimental view of Mary cheek-to-cheek with Christ. 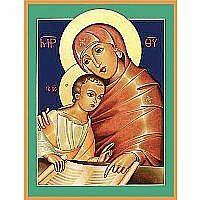 In this icon she wholly embraces her child and her cheek rests next to his. The pose reminds us of icons of Mary consoling the child Jesus in her arms as angels hover with symbols of the crucifixion. Mary wears blue in this icon, the color most frequently associated with her in Western art. Medieval patrons often wanted the most expensive paint to be used for the clothing of the Blessed Virgin Mary. Blue came from lapis lazuli and soon became associated with Mary. 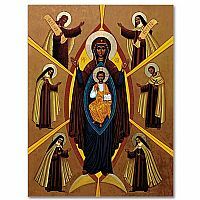 In the Orthodox churches, however, Mary is clothed in red or brown as the one who, like Adam, provides the flesh (red) or clay (brown) in the Incarnation of the second person in the Trinity. 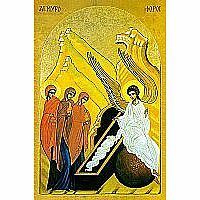 Because of this she is given the title in Greek Theotokos, which means, �God bearer.� Sr. Marie Paul has created an icon for Christians in the Western tradition so she uses blue, which immediately recalls for us that this is the Mother of God. The face of the figure in an icon is the �true� icon; everything else is more or less a footnote. Eyes are very important because they are the way in which we reach the sacred in these images. Closed eyes are used to indicate that someone is dead, but in this icon Jesus� eyes are half opened and glazed over. Perhaps this intends to show that Christ is truly dead but that he will conquer death and rise again. The halo around the face of Christ is marked with a cross and the Greek letters, omicron, omega, nu. These translate as, �The being one,� or more commonly, �Who am,� the name of God given to us in Exodus 3:14. Contemplate this image to ponder the mystery of Christ�s sacrifice which saves us from death. 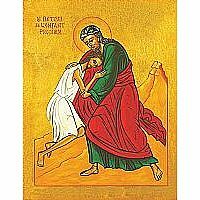 Empathize with Christ�s sorrowful mother who holds his lifeless body in her arms, and recall that it is for our sins that he had to suffer. The empty cross which stands tall and mighty in the background foretells Christ�s glorious resurrection by which our faith is vindicated.